alaTest has collected and analyzed 428 reviews of Sony FDR-X1000V. The average rating for this product is 4.3/5, compared to an average rating of 4.1/5 for other Camcorders for all reviews. Reviewers are impressed by the price and design. The image quality and size are also appreciated, whereas there are some mixed comments about the battery. We analyzed user and expert ratings, product age and more factors. 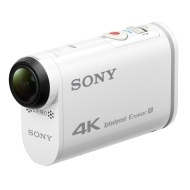 Compared to other Camcorders the Sony FDR-X1000V is awarded an overall alaScore™ of 95/100 = Excellent quality. After mounting some pretty stiff competition against the incumbent frontrunner GoPro for the past few years, the X1000V's combination of features and performance might just tip the scales in Sony's favour.